Taoiseach Leo Varadkar will travel to Brussels today to lobby key EU leaders to pledge major emergency aid for Ireland if the UK crashes out next month. Mr Varadkar is expected to petition for cash injections and a loosening of strict EU rules on aid in order to combat the fallout from a chaotic Brexit. With no consensus emerging from London on the Irish backstop, no-deal plans are being ramped up here – including changes to VAT rules and infrastructure at ports and airports. Plans to keep rail lines open between Ireland and Northern Ireland are also being examined. Finance Minister Paschal Donohoe told an Oireachtas committee that discussions were ongoing with the EU Commission on state aid that may be needed. The Fine Gael leader’s back-to-back meetings with EU leaders comes a day ahead of Theresa May’s own set of meetings in Brussels. She will arrive tomorrow to press the EU to allow negotiations to reopen or face the threat of a no-deal scenario. In Belfast yesterday, Mrs May moved to reassure people her commitment to avoiding a hard Border was “unshakeable”. But she was not able to spell out what changes she was seeking, causing the Irish Government to warn against “unrealistic expectations”. Mrs May’s comments also angered Brexiteers who fear that her speech steps back from previous assurances. Mr Varadkar will make the case for Ireland not to emerge as a scapegoat as a result of Brexit with key EU figures today including Donald Tusk and Jean-Claude Juncker. He will look for support in a series of back-to-back meetings with key EU figures and is expected to seek cash injections and a loosening of aid rules to provide targeted help for industries worst hit by a chaotic Brexit, including fishing and farming industries. Ireland has already put the EU on notice that it will make an application for emergency supports if no deal comes to pass, and sources say Mr Varadkar’s purpose in Brussels will be two-fold. Firstly he wants to shore up support for the backstop and thank EU chiefs for standing so resolutely behind Ireland in the past week. However, he will also be seeking assurances that Ireland will not be scapegoated in a no-deal scenario. This country will be looking to Europe for “major financial assistance” if the UK crashes out, particularly in the area of agriculture and small enterprises. The European Commission’s no-deal contingency plans already recognise that Ireland stands to be more adversely affected by a disorderly Brexit than other member states. They have committed to addressing “the specific challenges of Irish businesses” – but what exactly this means has yet to be defined. The EU will provide technical and financial assistance for the training of new customs officers, however Mr Varadkar’s requests are likely to be more heavily weighted toward direct intervention in certain sectors. While the EU’s no-deal plans state that the union’s laws provide for “a variety of instruments to cope with the most immediate effects of the withdrawal of the UK”, Mr Varadkar is likely to ask what this means in particular terms. Already Business Minister Heather Humphreys has lobbied heavily for a temporary relaxation of state aid rules. 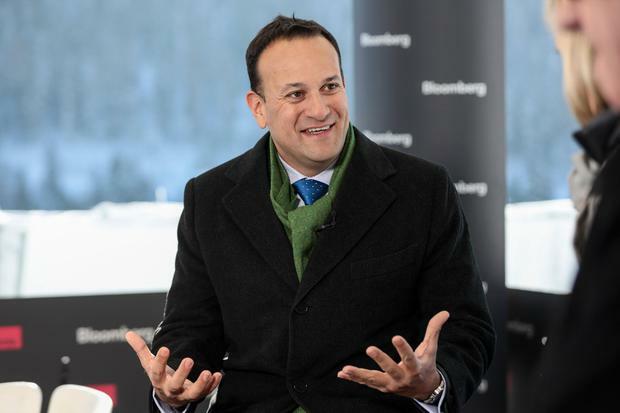 Speaking ahead of his meetings, Mr Varadkar said “ongoing uncertainty in London” means that no-deal preparation is being ramped up. EU Commission officials were in Dublin yesterday discussing contingency plans for a no-deal scenario. Finance Minister Paschal Donohoe told an Oireachtas committee meanwhile that if Britain leaves without a deal “there will be trade-offs and choices that have to be made” in order to avoid Border infrastructure which the Government is resolute it will do. In Belfast, Mrs May moved to quell anxiety in Northern Ireland over her new Brexit strategy but was unable to spell out her alternatives to the Irish protocol. She was forced to deny she had performed a U-turn on the backstop – a legal insurance policy to prevent the re-emergence of a hard Border on the island of Ireland – and said any new Brexit deal will include one, but changes must be made to the current backstop to ensure the deal commands a majority in Westminster. But Downing Street was unable to clarify what the preferred option to achieve those changes was, saying a number of options – all of which have been previously ruled out by the EU – are being looked at. However, DUP leader Arlene Foster appeared to leave room for manoeuvre on the backstop solution, branding the “current backstop” toxic. A spokesperson for the Taoiseach welcomed Mrs May’s commitments on the Border but expressed concern about “unrealistic expectations” over what can be achieved with the backstop. Mrs May said pledges made in the joint report in December 2017 were made in “good faith” and said the British government will honour the principles of the Good Friday Agreement.